Full Grain Cashmere Napa Leather. Front zipper pocket provides storage space for small miscellaneous items. Front organizer with storage space for media devices, cell phone, business cards, key holder and pens. 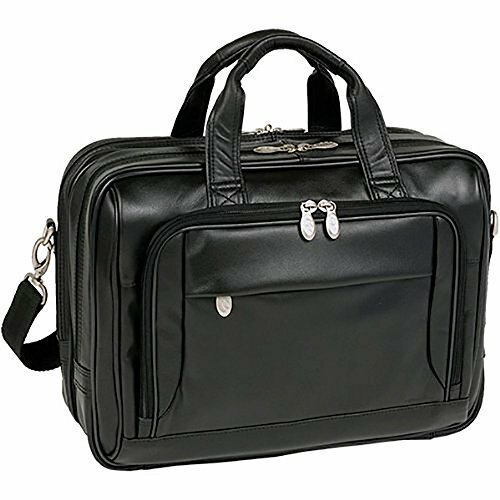 Front compartment features file divider for documents and has an expandable feature to provide 30% more storage space. Back Compartment padded with high-density foam to protect laptops up to most 15.6"in size. Smart Zipper Attachment allows transport on extended handles of other rolling cases & luggage. Advanced, non-slip, shock absorbing neoprene Comfort Flex Shoulder Strap stretches for comfort, alleviating body strain. Dimensions: 16.5"x5.5"x12"